Endurance riding There are 16 horses. 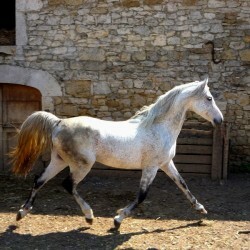 Prim de Syrah, indexed*** on progeny, is the leading stallion of the stud. He passed away at the age of 28 years old, in March 2018. 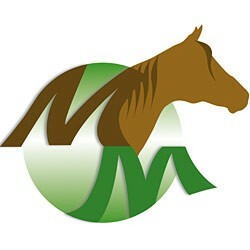 Covering only the mares of the stud, Prim is now the sire of more than 60 products. 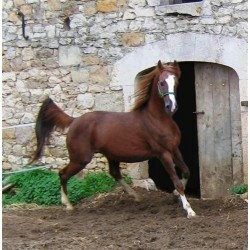 Foal of the good-natured Djad ** and Aïcha de Bozouls **. Aid des Agachiols is thick, brawny, has got an excellent metabolism rate and a good size in his strides when galloping. He transmits on his sporty model, an excellent cardiac and impressive hindquarters to his progeny. Thus he is indexed DRE** thanks to his progeny. Son of Prim de Syrah**** and Benamira**, Benapi de Bozouls is qualified on 90 km. 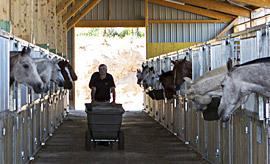 He had 10 foals at the stud, among them horses at competition or sold and exported, such as Adadja de Bozouls, vice world champion in 2017. Son of Diaf*** and Aïaffa lotoise*** (Chéri Bibi), Djad has few but exceptional offspring since 3 out of them 4 are ranked at National** or *** level. He is thus indexed** on progeny and IRE* as he ranked several times on 90 km events. 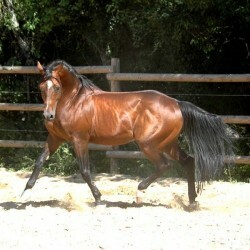 Son of the great Manganate, Faouzi is the sire of great champions on international endurance events. Before passing away, he passed on his great blood line to 30 offspring of the stud farm, in which 2 greats champion, which allows Faouzi to be indexed**** on progeny. As he ranked twice on 120 km races at Huelgoat and Argentant, in 2005, Farid del Saul is indexed IRE** on perforances. 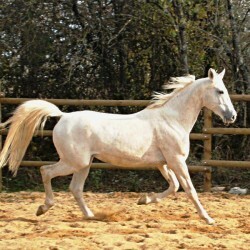 Since he is stallion at the stud farm he passed on his great qualities and willingness to all his offsprings (>50), in which 30 of them are ranked on CEI*, ** and ***. Son of Prim de Syrah**** and Méduse***, Med des Agatchols is the only product born with these great breed lines. Being a nice model and thanks to these origins, he was kept entire. Med des Agatchols is a large, athletic horse and has full given paces. He qualified on CEI*** and is thus indexed IRE**. 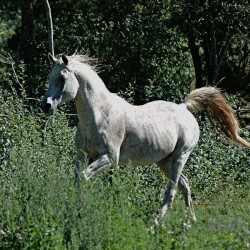 Son of Diaf*** and Aïffa Lotoise*** (Chéri Bibi*** x Djebelia***), Rim matted at the stud farm from 1995 to 1997. Out of his 9 products, 4 are still broodmare at the stud farm and all his progeny is indexed ** or *** on performances. Rim is indexed *** on progeny. 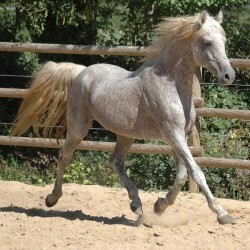 Primalja de Bozouls is a son of Prim de Syrah *** and Aljaïma de Bozouls **** (Diaf** x Aïffa Lotoise). Being an exceptional model and thanks to his prestigious list achievement at competition, Primalja will be kept as stallion in order to continue his sire's lineage at the stud. 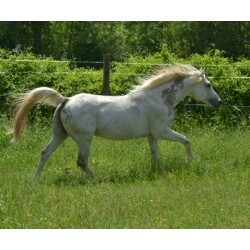 Since 2018 he is available for outdoor breeding.